from blogs.smithsonianmag.com: "There is a story, regrettably apocryphal, about Napoleon and the Great Pyramid. 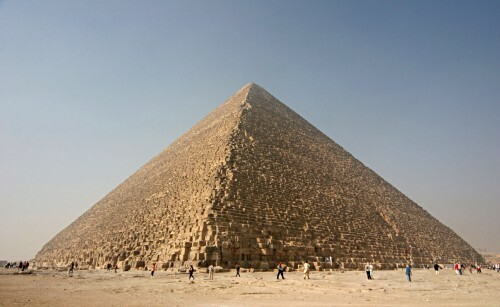 When Bonaparte visited Giza during his Nile expedition of 1798 (it goes), he determined to spend a night alone inside the King’s Chamber, the granite-lined vault that lies precisely in the center of the pyramid. This chamber is generally acknowledged as the spot where Khufu, the most powerful ruler of Egypt’s Old Kingdom (c.2690-2180 BC), was interred for all eternity, and it still contains the remains of Pharaoh’s sarcophagus—a fractured mass of red stone that is said to ring like a bell when struck. As I say, the story is not true—Napoleon’s private secretary, De Bourrienne, who was with him in Egypt, insists that he never went inside the tomb. (A separate tradition suggests that the emperor, as he waited for other members of his party to scale the outside of the pyramid, passed the time calculating that the structure contained sufficient stone to erect a wall around all France 12 feet high and one foot thick.) That the tale is told at all, however, is testament to the fascination exerted by this most mysterious of monuments–and a reminder that the pyramid’s interior is at least as compelling as its exterior. Yes, it is impressive to know that Khufu’s monument was built from 2.3 million stone blocks, each weighing on average more than two tons and cut using nothing more than copper tools; to realize that its sides are precisely aligned to the cardinal points of the compass and differ one from another in length by no more than two inches, and to calculate that, at 481 feet, the pyramid remained the tallest man-made structure in the world for practically 4,000 years—until the main spire of Lincoln Cathedral was completed in about 1400 A.D. But these superlatives do not help us to understand its airless interior."